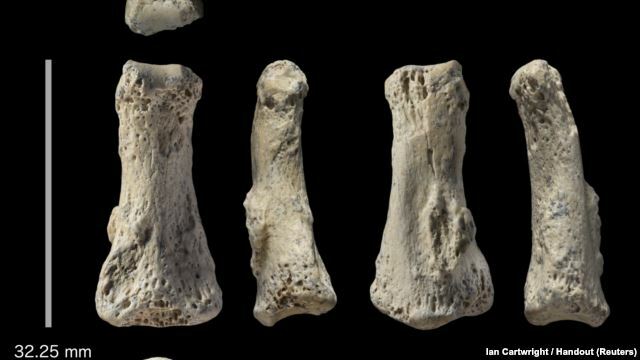 A finger bone is pointing to what scientists are calling a new understanding of how ancient human beings came out of Africa and began settling the rest of the world. The middle bone of an adult’s middle finger were unearthed in the Nefud Desert of Saudi Arabia. It was found in an area called Al Wusta. Testing has dated the fossilized remains to about 90,000 years ago. Researchers reported that it is the oldest Homo sapiens fossil ever found outside of Africa and the eastern Mediterranean Levant area. They also said it is the first human fossil from the Arabian peninsula. While the Nefud Desert is now a sea of sand, it was green when this Homo sapiens lived. The researchers say the area was once a grasslands, filled with wildlife, near a freshwater lake. Our human ancestors first appeared in Africa about 300,000 years ago. Scientists once thought Homo sapiens left Africa in a single, fast migration some 60,000 years ago. It was thought they moved along coastal areas, eating fish and other sea creatures, said Michael Petraglia. He is an anthropologist with the Max Planck Institute for the Science of Human History in Germany. This fossil bone, measuring 3.2 centimeters from end to end, suggests our species left Africa much earlier. Petraglia explained that the fossil supports the idea that Homo sapiens did not move all at one time, but slowly and over many years. The discovery also shows these people were moving across the interior of the land, not just along the coastline, he added. Near the fossil finger, scientists also discovered many animal fossils, University of Oxford archeologist Huw Groucutt said. Bite marks on fossilized bones showed that meat-eaters lived in the area. “We know that shortly after they lived, the rains failed and the area dried up. Did this population die out? Did it survive further south in Arabia?” Groucutt asked. He noted that the drying environment many have pushed them into Eurasia. A report on the findings was published in the magazine Nature Ecology and Evolution.